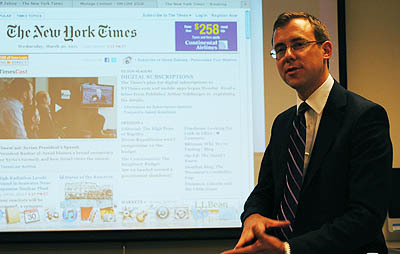 New York Times Political Reporter Jeff Zeleny told SPJ DePaul students on March 30 that covering political campaigns can be a fun, challenging job, but reporters must leave their own political views out of the picture. Zeleny, who will be covering his fourth presidential election in 2012, told students he doesn’t consider himself a Republican or Democrat and does not vote in elections he is covering. He also encouraged students to reach beyond traditional reporting, as he has done in his career, to try new things. He showed an example of how he and a Times photographer teamed to produce an audio slideshow about President Obama’s receptionist called “Receptionist of the United States.” Zeleny wrote the script and proved the voice-over for the slideshow. He also shared his career path from his days studying journalism at the University of Nebraska-Lincoln to working as a political reporter with the Des Moines Register, Chicago Tribune and the Times.